A test done here at Webtron to measure our internet speed. Find out your speed test here! Technology continues to advance at a frightening pace. And the internet continues to gather speed with almost fervent energy as new ways to distribute it become available. From satellites to fibre optic cable, we are forever trying to increase its speed and momentum. Around Australia and the world, due to varying infrastructure conditions and environments, its very difficult to sometimes know what the actual speed of the internet is in any one particular location. Thus, several programs and websites were born with the sole purpose of measuring internet speed. But what use is this for business? Well, plenty! In the age of interactive online services, the need for faster and more reliable internet up and down speeds is increasing. Examples of bandwidth and speed hungry interactive online services and interactions can vary from live stream video, interactive web presentations, video-internet telephony (e.g. Skype) and online auctions. Before a problem surfaces, a user can test the internet speed to see if any online interactivity is possible in a remote location. This is important for businesses who wish to do a site survey in a location before an event takes place. This way, further preparations may be made to make up for the lack of internet connectivity. Why should businesses check speed testing? So why is this important for businesses to check? First, we must look back at the history of the internet, and how the speed of it has impacted what can be done online. Back in the late ’90’s to mid 2005, the internet relied on the service of Dial-up. This utilised a phone line connection. Internet speeds through this could reach at the most, 64kps per second. In comparison with beginning broadband connections (that began at 128 kps per second), watching videos online and doing anything such as playing games, shopping online and viewing websites on smart phones was but a pipe dream at this point. But the internet evolved rapidly. With mobile internet becoming faster and faster with the rise of 3G and 4G, as well as broadband slowly becoming more accessible to the public at higher and higher speeds, new possibilities became reality. Live streaming, for example, began to become a global phenomenon, with anything from auctioning a house online for sale, live streams of global events, and video advertising became a thing of the present rather than a dream of the future. The internet speeds of the world today, displayed at the Net Index. 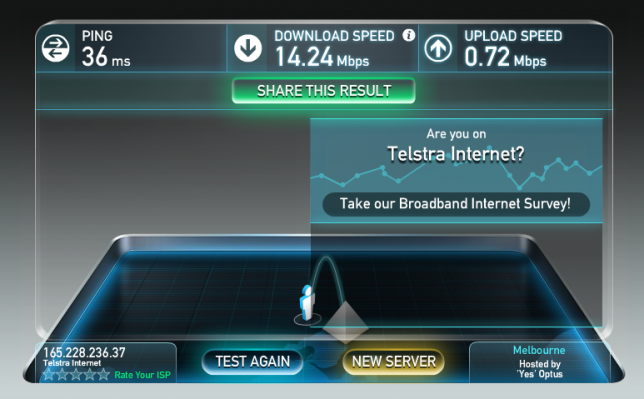 With the improvement of internet speed came the need to test the speeds around us. And thus was born the need for speed testing. It was not only the public that benefited from the rise of internet speeds. It was also a great benefit to businesses. Websites could become bigger and better, and sales tactics changed. Now, shops online began to emerge and become a fast growing hit. Overall, with the internet being a core substance of businesses today, knowing what speed you are running on, and thus, your clientele, has a fundamental impact on everyone today. Find out your speed test here!